A glazed courtyard and roof lights draw daylight into this small house in south London, which was designed by local studio Hayhurst and Co for a plot where no outward-facing windows were permitted. 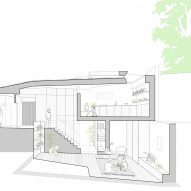 Hayhurst and Co created Whole House for developer Bramfield, which works alongside architects to build bespoke homes across the British capital. 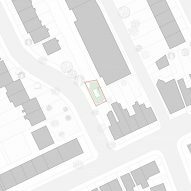 The property occupies the site of a former garage in Clapham and is bounded by the back gardens of several existing houses, as well as a 1990s mews development. 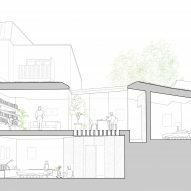 The two-storey building comprises a single level above ground and a basement below, providing a total floor area of 92 square metres. 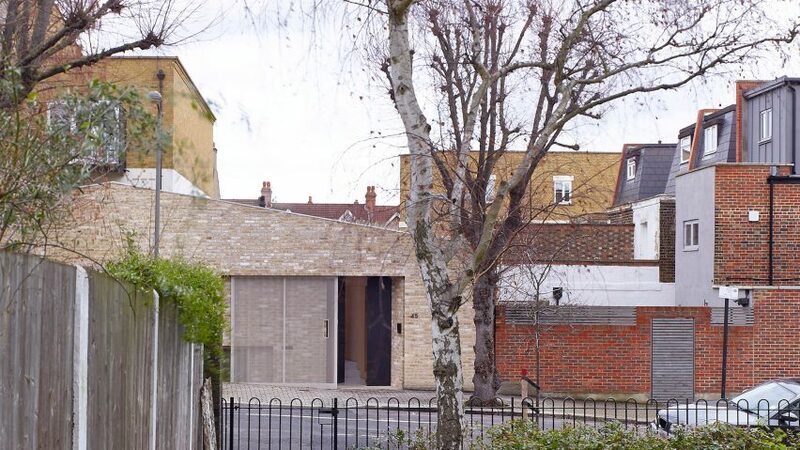 The house's simple exterior recalls the garage that previously stood on the plot, with its windowless brick facade also referencing the materiality of the surrounding buildings. A sliding gate formed from a ridged sheet of perforated metal conceals a recessed entrance, which is set back into a wide reveal that also incorporates a smaller gate providing access to the bin store. 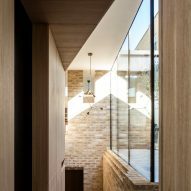 The house's interior is organised around a glass-walled courtyard that allows natural light to reach the living spaces on both levels. 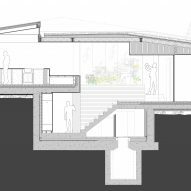 The entrance leads to a set of steps that wraps around the corner of the central atrium, before opening out into a combined kitchen, dining area and lounge. "The circulation and day-lighting strategies were developed together to create a long, light and picturesque promenade: a device to provide views to the sky, surrounding roofs and tree-tops," said the studio. 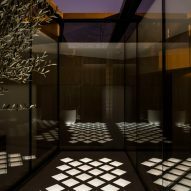 "Walking around the central courtyard provides views in each direction and an abstract visual connection to the site's environs," it continued. The width of the stairs changes at various points, creating a sense of elongated perspective and altering the tempo of movement throughout the house. 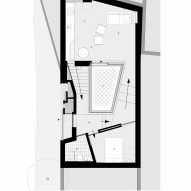 Skylights in each corner of the ground-floor plan draw the eye upwards and help to increase the illusion of space, while the courtyard provides a valuable outdoor seating area. 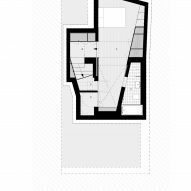 A bedroom is accommodated to one side of the entrance, with stairs on the opposite side descending to the basement. 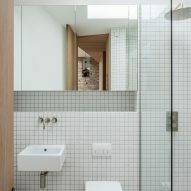 The lower level contains a second bedroom, bathroom and utility room, with natural light flooding in through glass blocks set into the floor of the courtyard above. Built-in cabinetry on both floors keeps unwanted clutter hidden from view. 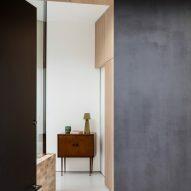 Doors and cabinets are also incorporated into the unbroken wooden surfaces to continue the clean-lined, minimal aesthetic. The joinery introduces a sense of warmth and tactility that is complemented by exposed brick walls. The rest of the finishes are kept neutral and light to maintain the bright feel of the interior. The project featured on the longlist for the 2017 RIBA House of the Year, which was awarded to a contemporary country house with chimney-like roofs inspired by traditional oast towers. Photography is by Marcus Peel and Kilian O'Sullivan.